Concept and Classification of Resources Distinguish between stocks, reserves and resources and define resources within particular contexts (environmental, cultural, economic, technological and political). Provide a classification of natural resources based on the concepts of renewable (flow) and non-renewable (capital) resources. 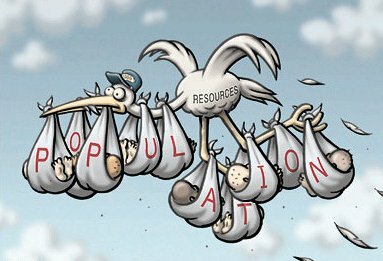 Population–Resource Relationships Appreciate the relationship between population and the resource base (carrying capacity) in a natural environment, and describe and explain the way this relationship differs between human populations and their resource bases. This should be done by examining the theories of Malthus and Boserup, the views of neo-Malthusians (Club of Rome, Ehrlich) and contrary views, and population–resource regional classifications. Population Projections and Policies Demonstrate an understanding of the UN population projections, the basis on which such projections are calculated and the reasons for undertaking them. Use case studies to describe, explain and attempt to evaluate pro- and anti-natalist population programmes.